I claim no credit for this image. Normally, I wouldn't poke fun at Blizzard because they have a fairly flawless track record as a game developer. However, the world is changing and Blizzard with it. Every company is locking their games into "platforms" and it's starting to get a bit silly. Oh, and I can sympathize with the gamers that long for the days where LAN support was one of Blizzard's standard features. The bullet points in the picture are agreeable to my persuasion as well. As a gaming community, we seem to be losing a lot in favor of Facebook and Twitter integration. Game developers appear to be looking at the new social media as a replacement for what has worked great for years. Actually replacement is a strong word, as what we're really getting is "integration with and instead of X". However, we're still being tied to the developer's own platform rather than offloading entirely to the social media maven of choice. It's one thing to offer "Facebook Connect" in place of a developers own account system; it's another thing entirely to integrate a game into Facebook status updates. Don't get me wrong, I like the idea of consolidation to a central "hub" that can be tied into. That is why I am more of a fan of Facebook Connect than I am of Facebook itself. I like creating one account and being able to use it on tons of different websites. Just as I like having a Steam account and having that account integrated directly into a game via Steamworks. Battle.net 2.0 is great for gamers that will stick to Blizzard games and I suspect there is enough of them to make it a success. 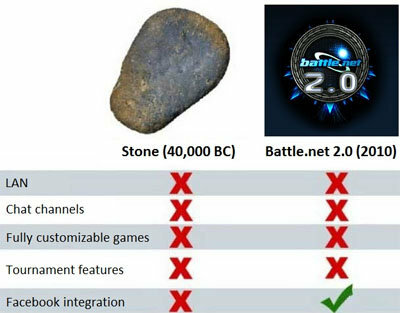 However, Battle.net 2.0 is NOT that much different than a 40,000 year old rock when the games are removed.